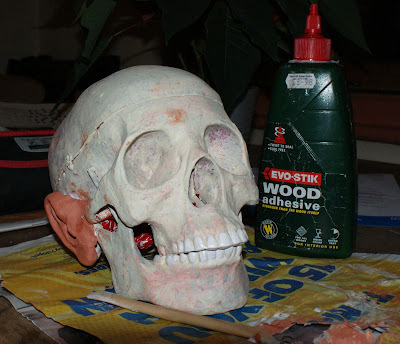 How to make a mummy's head! Heads usually start off with a skull. This is important to achieve a high degree of realism. It also makes it an art of finding. Because the head is made by multiplying several layers of "tissue" over the skull, it is near impossible to predict what the head will end up looking like. It had originally been painted with horrid red and white marble effect. I used DAS to model the ears, but then switched to FIMO Ultralight for the face, hoping that it would be easier to work. This turned out to be a mistake. It you have to do it, DAS is the way to go! It is just as hard to work as Fimo, will come off and apart like Fimo, but will not crack...Unlike Fimo. Before proceeding with the facial construction, the ears and eye sockets are filled with textiles, just like a real one. This will make building up the nose and eyelids a lot easier. The facial construction is then operated is several phases, to allow each layer to dry before applying the next. Painting then requires a good 4 to 5 layers, starting with the lightest to the darkest. Paint needs to be applied thinly in order to allow previous layers to come through. In this case, the fist layer was Ochre Yellow and Burnt Umber (mostly yellow) followed by Burnt Umber and Cadmium Red (mostly red) with shadows accentuated in brown (Burnt Umber and Ultramarine), plus a splotch of white here and there for good measure. The outer layer is super watered down Burnt Umber and Ultramarine. Note traces of the marble effect on the back. to find the best type to suit your skull. Ears are fitted on and checked for alignment. Evostik probably makes the best ear glue to date. Highly recommended! just like a real one! Phase 1 of facial construction completed. the overall texture of the skin. 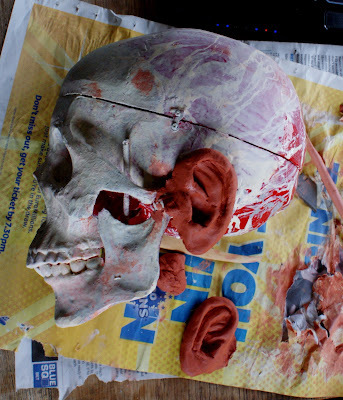 After completion of the facial construction, the whole head is primed. Second layer of paint. Note how the first layer shows through. Shading over the second layer of paint. A few layers later and the head is pretty much finished.